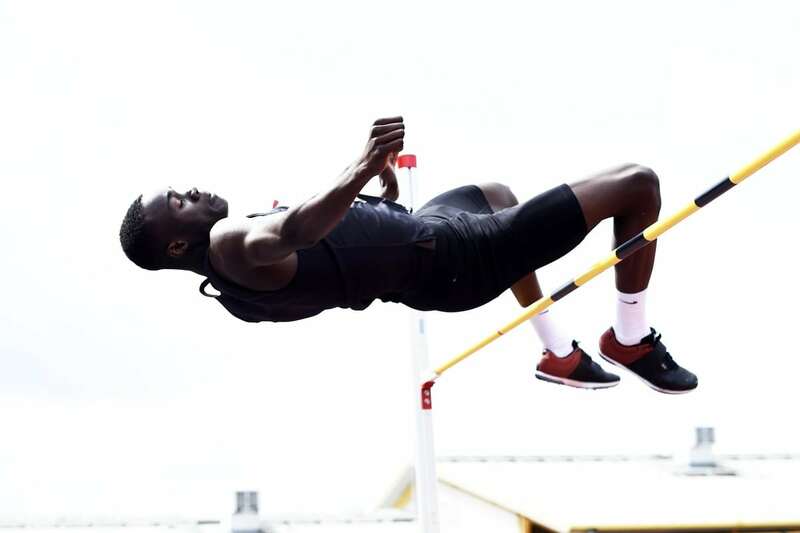 A UK age-group best from javelin thrower Benjamin East and another great performance from European under-18 high jump champion Dominic Ogbechie (pictured) highlighted the opening day of action at the England Athletics Under-17 and Under-15 Championships in Bedford. East added 9cm to his own UK under-15 best with his 67.04m as he finished more than 13m clear of the rest of the field. The Team Kennet athlete thus added to his English Schools title this summer as he set the championship best and claimed his third national age mark of the year. Ogbechie produced the best jump outdoors by a British under-17 since 1982 as he cleared 2.18m at his third attempt. The Highgate Harrier, who has gone over 2.22m indoors, added 2cm to the outdoor PB he equalled when winning European gold in Gyor last month. Before setting this championship best, he was earlier given a stern challenge by Sam Brereton, whose 2.11m for second was a PB by 3cm. A championship best also went to Georgina Scoot in the under-15 triple jump with 11.80m, the best by a Brit in her age group this year and the second best all time. Lewis Byng went to third equal on the UK all-time under-17 shot rankings with his championship best of 19.45m. In the under-17 shot, Serena Vincent also set new figures with 16.03m. Also setting UK leads for their age groups were Lazarus Benjamin, who won the under-15 pole vault with 4.01m, under-17 discus thrower Joshua Douglas (55.96m) and under-17 triple jumper Archie Yeo (14.43m). While most of the finals were in the field, the 100m races saw quick times, led by under-17 Amy Hunt’s PB of 11.56 and Remi Jokosenumi’s 10.84, which was just a hundredth of a second outside the UK under-15 best but with a 2.1m/sec following wind. European under-18 champion Raphael Bouju of Netherlands was under his PB with 10.50 in winning a wind-assisted under-17 100m. James Wardle was among the winning middle-distance athletes, taking three seconds off his PB with 9:14.81 in the under-15 3000m.